Pets are important members of the family, and nothing can replace the years of love, dedication and companionship they provide. The Petcaskets.com staff is committed to helping pet owners find the most appropriate method for laying to rest a beloved friend. Petcaskets.com offers a complete line of pet funeral products, including caskets and other items. Monuments, markers, urns, memorials and a line of jewelry will be available soon. Toronto, Canada, September 20, 2010 --(PR.com)-- For most people, the death of a beloved pet means losing a family member. Pet owners face particular challenges when it comes to laying the pet to rest in a manner that provides dignity to the pet, and comfort and solace to the pet owner. With a commitment to offering a dignified farewell to those cherished animals that share our homes and our lives, Petcaskets.com has launched online to introduce its new eco-friendly pet coffins, each individually sized and customized to accommodate all pets, from small to large. 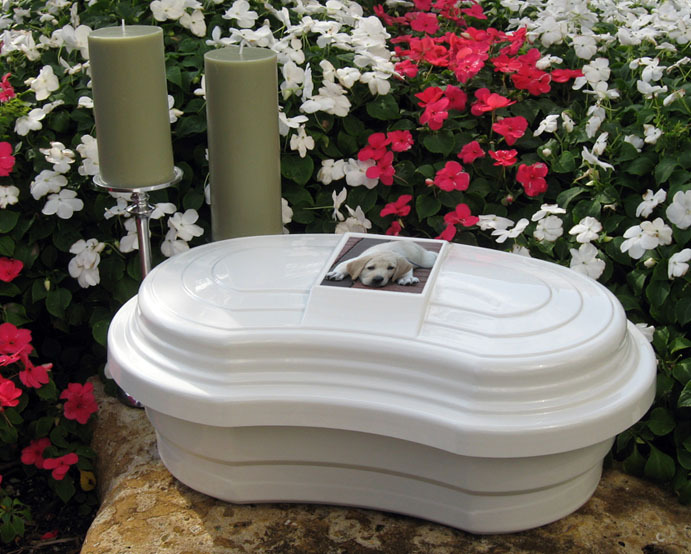 Every pet caskets is made from a seamless, thermoformed acrylic composite containing no fiberglass, toxic resins or non-recyclable components. Double walled and ergonomically designed to accommodate the pet in its most natural resting position, each pet casket comes complete with interior fitted mattress, pillow, shroud and attached photo frame. Choose from a selection sized to provide a peaceful and secure casket for virtually any pet. “Losing a pet is difficult for anyone,” said Desmond Kendall, President of Petcaskets.com parent company Castek Environmental Products Inc. “We believe that burying a pet responsibly and with dignity can be a healthy way to grieve the loss and achieve a sense of peace and closure. “Our goal is to provide pet owners with an ecologically sound option to accomplish this,” Kendall said. Pets are important members of the family, and nothing can replace the years of love, dedication and companionship they provide. The Petcaskets.com staff is committed to helping pet owners find the most appropriate method for laying to rest a beloved friend. Petcaskets.com offers a complete line of pet funeral products, including caskets and other items. Monuments, markers, urns, memorials and a line of jewelry will be available soon. A division of Castek Environmental Products Inc., (CASTEK), Petcaskets.com’s coffins are manufactured in the company’s state-of-the-art Toronto factory. All design work, fabrication and decoration is performed in-house, and shipped ex-factory to anywhere in the world. Each pet casket is individually packed in a heavy-duty carton produced from recycled paper fibers and ships complete including specialized double-sided tape for a secure seal. Incorporated in October 29, 1997, Castek is a related company of Swedcan Lumican Plastics Inc., a leading Canadian plastic distributor since 1980 specializing in high-performance plastic sheet and proprietary thermoformed products.